Discussion in 'Education' started by satish, Jun 16, 2016. Ahead of the foundation-laying ceremony of VIT-AP campus on Thursday, the administration of the varsity announced that it will adopt three villages in the capital region and turn them into model villages. In a press meet held on Tuesday, founder and chancellor of VIT University G Viswanathan said the varsity will adopt Velagapudi, Sakhamuru and Inavolu villages. "We will adopt the three villages where the government allotted us land. We will develop them with all necessary facilities - education, health and other infrastructure. The formal announcement will be made on the day of foundation-laying ceremony," he said. The foundation for the first private university in the capital region, VIT-AP, will be laid on Thursday at Inavolu by chief minister N Chandrababu Naidu and union minister Venkaiah Naidu. The varsity administration also announced that it will launch an initiative called Andhra Pradesh - Support The Advancements of Rural Students (AP-STARS), under which students from rural areas will get financial support. "We will select two students from each district - a boy and a girl - who top intermediate examination in their district. These students will be offered free education at VIT-AP. Boarding, lodging and even books will be free of cost for them," G Viswanathan explained. The management has decided to extend this initiative to students from government junior colleges in rural areas. The students who top the intermediate examination need not clear VITEEE, the common entrance examination for admission, the management added. Elaborating on VIT-AP's vision, Viswanathan said they are foraying into AP to increase the gross enrolment ratio (GER) in the state's higher education sector, besides providing high quality education to the people of AP. 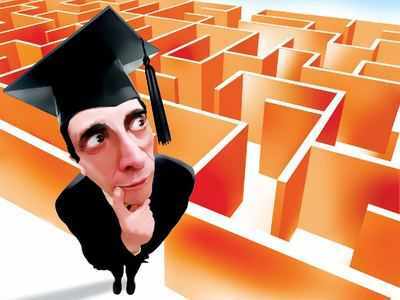 "India is behind the world GER average in higher education sector, with an average of about 23 per cent against the world average of 33 per cent. Some states like AP are doing well with around 27 percent, but we have a long way to go to meet global standards," he said. The construction of campus at Inavolu will begin right after the foundation-laying ceremony and the operations will begin from 2017-18 academic year. The university is looking at constructing three buildings (two hostels and one academic building) with a built up area of about 20 lakh sft by July, 2017 to begin the classes. "The initial estimation of expenditure for the first phase is pegged at Rs 300 crore. The constructions will be finished by June/July. Eight courses in B Tech, M Tech and PhD will be available from the coming academic year. The academic session will begin in July, 2017 with about 1,000 students," vice-presidents of the varsity GV Selvam and Sekar Viswanathan told TOI. While the fee structure will almost be similar to the present fee structure of VIT University campus in Vellore, the management said a final fee structure will be announced shortly. The management also stated that VITEEE-2017 will be held from April 5 to 16 next year for which the applications will be available from November 9, 2016. VIT-AP will be a state private university which will abide by the AP Private Universities Act and will be independent of VIT University in its functioning. It may be recalled that the state government allotted 200 acres of land for the varsity. While the varsity has already purchased 100 acres by paying Rs 50 crore, the remaining will be given in the second phase subject to condition that the varsity should have 18,000 students within five years of commencement of operations. Pro vice-chancellor of VIT University V Raju, who will be the vice-chancellor of VIT-AP and other officials from the varsity were also present. Why study at VIT AP? VIT University is currently India’s top private engineering institution and has been so consistently in the past years. Our innovations in the fields of education and research have set the bench mark for higher education in India. With this history of 32 years of growth, VIT AP begins at the top and will only grow from here. Below are a few key features that will make your experience at our campus unique. Programmes to include mandatory work experience (co-op) industry. Focus on Engineering and Technology competencies, identified by industry and professional societies. Emphasis on hands-on-experience and real-world industrial applications. VIT AP offers the following eight programmes in its first intake. Eligibility criteria and admission procedure will remain the same as our other campuses. Classes will commence in July 2017. Please register at: https://docs.google.com/…/1FAIpQLSf04KCZPmwVUaGP3X…/viewform and confirm your participation (for planning food and other arrangements). AMARAVATI: VIT-AP, the first private university proposed to be set up in the Andhra Pradesh capital region, will come up at Inavolu and will be ready by July 10. The university management has said that classes for the first batch of VIT-AP will begin at 9am on July 19. According to a press release here on Sunday, vice-president of VIT-AP Sekar Viswanathan said the construction work of academic block with classrooms, labs, hostel and other facilities is progressing well as per the schedule. "The students, who enrol for B Tech, M Tech software engineering (5-year integrated course) and Ph.D will attend their first semester classes from July 19.Apart from 13 classrooms, three computer centres and labs for machines, electronics, mathematics and physics departments will be made available for the students," Sekar said. While the academic block and hostel building will have 1.25 lakh sft space, more buildings will be developed subsequently. RIT's Simone Center for Student Innovation and Entrepreneurship ranks #1 in the USA.